You either loved this movie when it came out in the theater, or you will love this movie after watching it on Netflix. The Hurricane Heist (2018: PG-13) tagline: $600 million stolen at 600 miles per hour. See what I mean? This is a fun action movie set in the middle of a natural disaster. Don’t complain about the unknown actors. You may not recognize anyone in the film, but all are good actors who are having fun playing their good guy or bad guy roll. Or are they the good guy??? Ryan Kwanten and Toby Kebbell play brothers who band together to stop the bad guys, even if they don’t look related at all. When you need your computer fixed, the tech people can wear whatever they want, so don’t complain about that, either. Who says computer geeks need to dress like nerds? 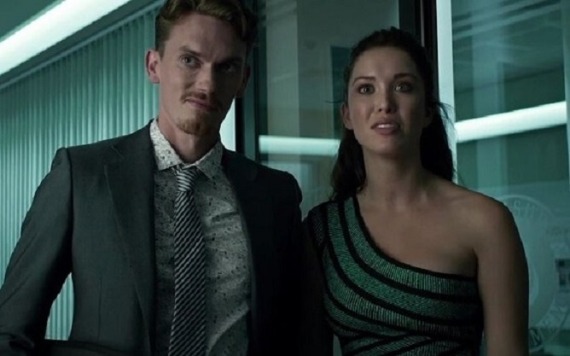 Ed Birch and Melissa Bolona dress for the storm. Heros need to hydrate. And eat. And go to the bathroom. It always annoys me when action stars spend the entire movie fighting and running and never drink anything except alcohol. See our heroes taking care of their basic needs, in addition to taking care of the bad guys. The storm is the star of the movie. The fancy storm chaser car The Dominator is also one of the stars of the movie. Watch this movie trailer. If you find yourself grinning, you will like this movie. What are some movies you like that people just need to stop complaining and just enjoy the ride?